ISLAMABAD: Prime Minister Imran Khan on Monday said PML-N President Shahbaz Sharif was acting as Nawaz Sharif’s frontman and together with the opposition he was trying to blackmail the government to get an NRO for the jailed ex-prime minister. Talking to the media persons at the Prime Minister’s Office here, he said the opposition parties were uniting for their corruption and wanted the people to come out in their support. The prime minister offered ‘facilitation’ to the opposition to launch a protest at the D-Chowk but insisted why masses would take to streets to cover up their corruption. He said the PTI government would also provide containers to the opposition leaders but insisted that the masses would not come out in their support. He said there had never been even a single public movement in the world that was driven only to protect the corruption of a family. “The PTI held two massive movements: one against rigging in elections; two for probe into Panama Leaks. It is neither the masses’ cause, nor do I feel threatened by the opposition,” he said. He came down hard on the opposition and charged that their hue and cry was to save their ill-gotten wealth. He recalled how the Qatari prince’s letters and Calibri font turned out to be a lie while the children of Nawaz Sharif became rich abroad. “The children of a three-time elected prime minister say, who live in London, that they are not answerable in Pakistan,” he noted. About the Pakistan People’s Party (PPP), he said Bilawal Bhutto Zardari was crying and criticising the government to save himself and his father from the National Accountability Bureau, as they were scared of it. Imran referred to a statement by Ch. Nisar Ali Khan that both Bilawal and Ayan Ali withdrew money from the same account and added that the PPP leadership laundered billions. Imran emphasised that there would have to be a same law for the poor and the rich, as application of different laws had ruined the society. Imran said the Sharif brothers had been in power for 30 years but they failed to build a single quality hospital where they could be treated. “The Sharifs focused on their fortunes and increased their factories from one to 30. They say, if anything happens to Nawaz, Imran will be responsible for that. Was Imran in power for the last 30 years? Their children could build Hill Metal and flats in London, but Sharifs could not build a new hospital,” he argued. He said the government had offered every possible facility to Nawaz and he could be treated anywhere in Pakistan. Imran said he knew that Ishaq Dar’s father had a bicycle shop but he (Dar) was being treated abroad. “Nawaz reflected a typical mindset,” he said. He emphasised that the NAB would have to lay hands on ‘big fish’, as going after ‘small fish’ had been useless and it was because of this the NAB had not been able to combat corruption effectively. He clarified that cases against the two ‘democracy-loving’ parties were not initiated by this government but much before that. He also said the NAB was not under the government and none was inducted into it by the incumbent government. Previously, he claimed, a former chairman NAB had closed some political cases and the apex court had also insinuated once on this count. He said corruption had increased because of NAB, as it took action from the bottom, whereas it needed to take on those on the top. Imran noted that new laws were being enacted to check corruption and money laundering had come down, owing to measures by the FBR and FIA. To a question about the performance of his cabinet members, the prime minister said he was satisfied with their performance. “The cabinet is my team. In the team, some players are good and some weak. The weak would be told to improve,” he said. Asked about some reports about replacing the Punjab and Khyber Pakhtunkhwa chief ministers, Imran said he had confidence in both and was satisfied with them. He said both the chief ministers would be given some time and the result would be before everyone. They would prove, he added, that they followed the government vision. Punjab Chief Minister Usman Buzdar, he pointed out, was a simple person, who was not spendthrift unlike Shahbaz Sharif, who spent billions on his projection, let Punjab in deficit of Rs1200 billion and cheque worth Rs100 billion was bounced. He said metro bus project was in deficit of Rs12 billion. Turning his guns to Nawaz, he said the former prime minister was nurtured by Zia and he had vowed to complete his mission after his death, being his stooge. "I presented a 40-year-old money trail in the court despite that I had not been in power previously," he said. He said the opposition leaders made faces when he entered Parliament and did not allow taking up the issues related to the masses problems. "A minute of Parliament proceedings costs the country Rs80,000 and all the opposition does on the floor is to cry," he stated. "The opposition is not thinking about the nation at all. Other than talking about hiding corruption, the opposition leaders do not raise any other issue on the floor of the House," he continued. "In the past, the Pakistan People’s Party laundered billions of dollars through fake bank accounts. PPP Chairman Bilawal Bhutto Zardari is crying foul because he fears the National Accountability Bureau (NAB)," he added. Imran said Ayan Ali and Bilawal's tickets were bought through the same fake bank accounts. “The most critical thing was our efforts for peace in Afghanistan. The Taliban wanted to meet me but on the objection from Afghan government that I should not meet them, it was not held. In my view, the interim setup in Afghanistan should hold elections and all, including the Taliban, should take part in the exercise and through votes it should be decided, who should rule that country,” he said. 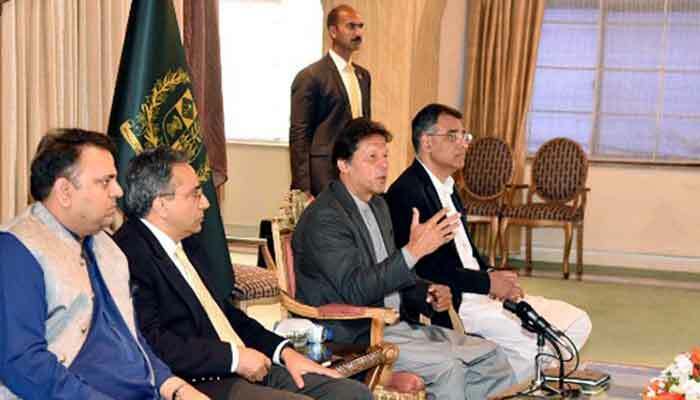 Imran said the government’s foreign policy was brilliant as compared to the last 20 years and today the United States, which would keep on telling Pakistan to do more, was today praising Pakistan that Islamabad could pressure the Taliban for peace. He said Pakistan had very good relations with Saudi Arabia, Turkey, Malaysia and excellent economic relations with China. About relations with India, he said there was no hope till elections in the neighbouring country. He said Modi had sent a message on the Pakistan National Day but was pushing ahead with the hate Pakistan and war hysteria. “Though it has been on the decline after Pakistan’s retaliation, threat would exist till elections, particularly there could be terrorism from them. Replying to another question, the prime minister said Pakistan was even behind Bangladesh in terms of human development index. “There is joblessness, energy crisis in the country. Costly gas was purchased and the previous government opted for costly power generation. This was because of corruption and massive spending was made on the smallest but powerful segment of the society,” he said. Imran said he did not live in the Prime Minister House but at Banigala and had already saved Rs350 million of the Prime Minister’s Office through austerity measures. The prime minister said he had spent Rs6 million from his pocket on his residence. Imran said he did not have camp offices, while Sharifs had declared five places as their camp offices and spending was made from the government kitty. He said the barbed wire for security at his Banigala residence was purchased from the party fund while he built the road, leading to his residence from his own pocket by selling a gift. Imran said he also afforded expenses of his house at the Zaman Park while Sharifs spent Rs350 million only on entertainment. The prime minister said a comprehensive poverty alleviation programme would be unveiled on March 27. Imran announced that Asia’s largest oil and gas reserves may soon be found in Karachi’s offshore waters. He said positive indicators in the exploration process had been found and the nation would likely be hearing major news on this front in the next three weeks. He urged the nation to pray for the success of exploration efforts and said the development could bring about a massive change in Pakistan’s fortunes. After nine years, offshore drilling begins in Karachi’s ultra-deep waters.